EXHIBIT: Charlie Hunter, "Where I Live Now," post-pastoral, post-industrial portraits of Vermont; and H. Keith Wagner, "Collections: Pods, Seeds & Stones," handmade metal sculptures. Pine Street Artworks, Burlington. Through April 13. A complementary pair of artists is currently presenting dual exhibitions at Burlington's Pine Street Artworks. The gallery aptly describes "Where I Live Now," by Bellows Falls designer and painter Charlie Hunter, as "post-pastoral, post-industrial portraits of Vermont." The other show, entitled "Collections: Pods, Seeds & Stones," is composed of sculptures and assemblage works by landscape architect and sculptor H. Keith Wagner of Ferrisburgh. Both artists seem to discover, rather than simply create, images. Both also reexamine the "post-pastoral" world in similarly somber, muted hues. Hunter presents 20 monochromatic landscapes, and his lines of perspective are so perfect that it's surprising to learn he paints en plein air. A viewer's first thought may be: These have got to come from slides. But Hunter is just that good - really a master landscapist. The spatial design of "Mill Street Railroad Signal" is particularly complex, as thin wires crisscross the vertical composition behind the perfectly drawn heavy hardware of the signal light. An expanse of low rooflines fills the lower third of the piece. Hunter describes his palette as consisting of "warm white, a cool white, unbleached titanium, Naples yellow, transparent red oxide and ultramarine blue." The paintings look much simpler, as if they are made up of raw-umber details described on pale yellow-white backgrounds. The chromatic richness of Hunter's actual harmonies imparts subtle variations of depth and atmosphere. "Farm and Sky" is nearly all atmosphere. Hunter employed wider contrasts in value for the tall, vertical painting, and, while it's not exactly more colorful than his other pieces, there's a wider delineation of warm and cool grays. That's quite effective for the subject, as a heavy thundercloud rolls over mountains and pasture on a warm summer's day. Hunter's largest piece in the show is the 48-inch-square "Closed for the Winter (Burlington Ferry in Snow Squall)." Silhouettes of the dock's port facilities sit atop a high horizon line, with curved tire tracks sweeping toward a vanishing point. The curves enliven and deepen the picture plane. Sculptor Wagner explains in his artist statement that he is "inspired by the agrarian landscape of my childhood." He is known around the region for creating sculptural spheres from metal, and three of them are in this exhibition. While they are appealing, his non-spherical work is far more original. "Pod" is a weirdly organic, conical form made of rusted steel. It's about 3 feet high and contains spikes within its tubular core. 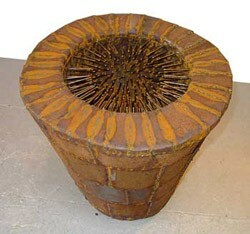 Wagner welded and inscribed lines over "Pod" that echo the rhythms of its interior spikes. "Vessel" stands at human scale, just about 6 feet tall, and has more of a seed form. Small sections of screen appear on the four outer surfaces of the bulbous body, and a small pyramidal tip rides atop it. Two thin bars, extending down to flat, square plates on the floor, support the work. "Vessel" seems like an out-of-context relic from a closed factory - something that once had a function but is now a strange object of curiosity. The three sparse assemblages in Wagner's "Collection" series appear to hold smaller curios from the natural world. Each is a horizontal, wall-mounted box, with minimalist specimens of stone, bone, bits of metal and other objects equally spaced within them. "Collection 1" holds six pieces of dug-up industrial detritus, and "Collection 3" includes the skull of . . . something. Wagner's pieces seems to be assembled from dusty natural-history treasures gathered from an old box, say, in the basement of the Smithsonian. Charlie Hunter suggests we think of his paintings "as photographs pulled out of a box 40 years from now." Fortunately, we don't have to wait that long to discover either of these bodies of work.